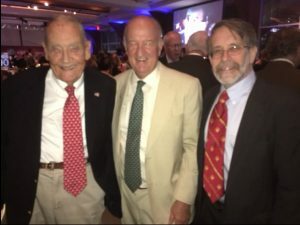 On Tuesday evening, Sept. 19, Steve Forbes, along with several hundred people, celebrated 100 years of Forbes magazine in New York City. B. C. (“Bertie”) Forbes began America’s foremost pro-capitalist publication in September 1917. My wife and I were there to meet up with quite a few celebrities, including Muhammad Yunus, the Nobel Peace Prize winner for his micro-credit revolution; Jack Bogle, the founder of the Vanguard Index Funds; and Warren Buffett, the world’s most successful investor. 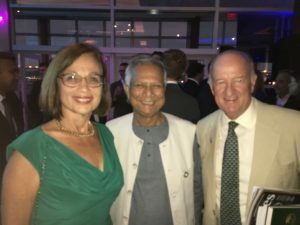 Muhammad Yunus, Mark Skousen and Jo Ann Skousen at the 100 years of Forbes Celebration. Buffett was the spokesman for the Forbes 100, the new list of influential business leaders. Many of them were in attendance, including Steve Wynn, Jack Welch and Jim Collins. They all have something in common — a giddy optimism about America. Buffett said that the Dow has risen 300% since 1917, despite wars, business slumps and bear markets from time to time. That’s music to the ears of Jack Bogle. “It’s tough to beat the market,” he told me. Over time, his Vanguard S&P 500 Index Fund has become the largest mutual fund in the world, with over $340 billion under management. Steve Forbes also spoke about the ups and downs of Forbes magazine over the past 100 years. Forbes struggled in the 1930s and during World War II, and right after the war, B. C. began The Forbes Investor, a financial newsletter that recommended stocks. “The newsletter was an instant success and provided the capital to reorganize the company,” Steve said. Great to hear B. C. Forbes was a fellow newsletter writer! Exclusive Did Your Portfolio Have 20 Double-Digit Percentage Wins in 2015? 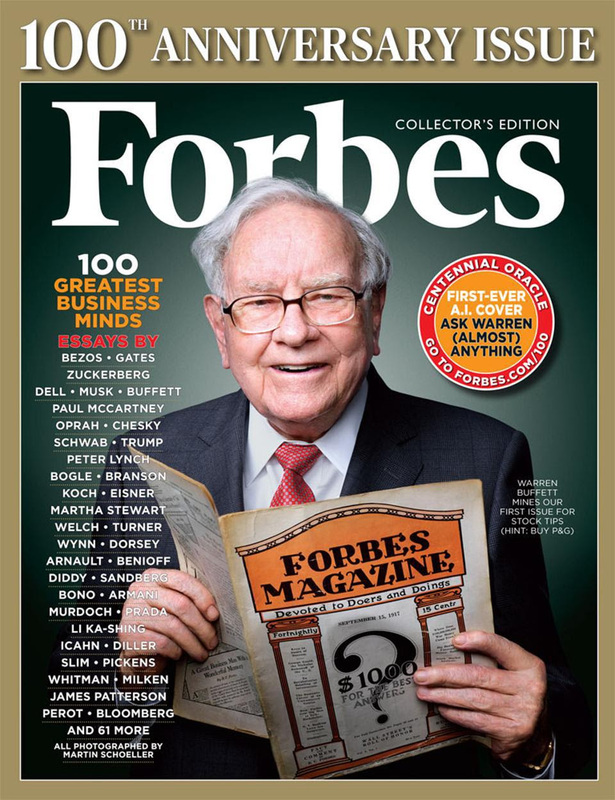 You can read Steve’s summary of 100 years of Forbes in the 100th anniversary issue that was just issued. I have a whole section in “The Maxims of Wall Street” on market timing, the bulls and the bears and whether you can beat the market. You can see why it’s Warren Buffett’s favorite quote book on investing. Thank you! Over the years, I’ve received many letters from subscribers, money managers, stock brokers, bankers and investors. It’s why “The Maxims of Wall Street” has become a bestseller, having sold over 25,000 copies and gone through five editions. You Nailed It! What’s in a Name? Ask Forbes! Tuesday night’s celebration of Forbes magazine’s 100th anniversary was upbeat. Not too many magazines have lasted that long. Even the vaunted Saturday Evening Post is no longer around. Exclusive Should You Join the Cobalt Profit Party? One thing I like about Forbes is that there is room for disagreement. Warren Buffett and Steve Forbes differ on their views about politics, but there they were together celebrating. It was wonderful to see. There was no divisive labeling of “left” and “right” — how refreshing. Why have Forbes magazine and Forbes.com been so successful, more than their competitors such as Business Week and Fortune? This was one of my questions at this year’s FreedomFest when we celebrated the 100th anniversary of Forbes magazine and the 70th birthday of Steve Forbes. It might have something to do with the name! According to a study in the June 2017 issue of American Economic Review, “Eponymous Entrepreneurs,” the authors conclude that companies that bear the name of their owner are “linked to superior firm performance.” But only 19% of all firms are named after their owners. But there’s nothing automatic about success in business, even if you have a famous name. Three generations of Forbes family members — B. C., Malcolm and Steve — have had their share of challenges, and there were times when Forbes magazine was on the ropes. But it always made a comeback. 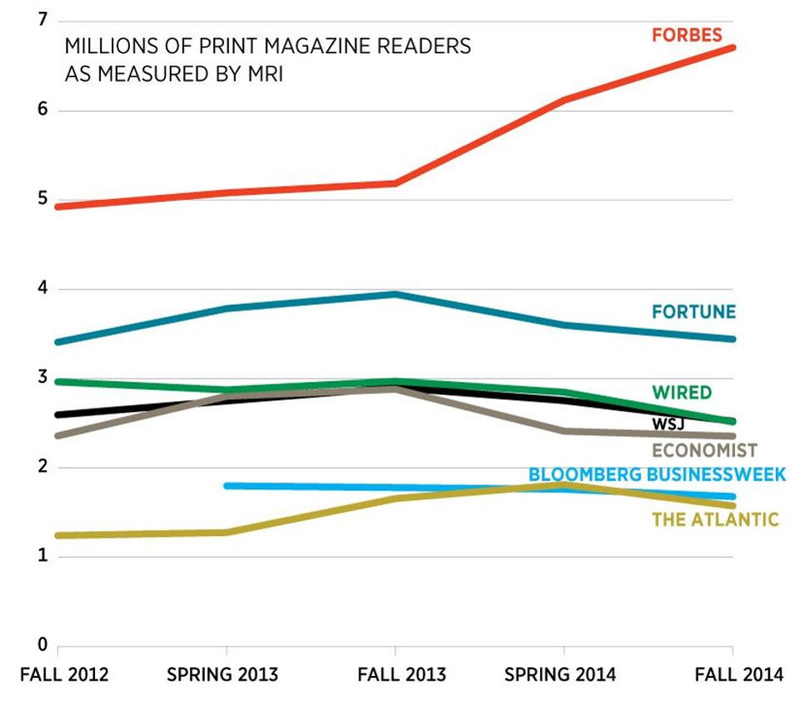 With the advent of the digital age, most economists predict the demise of the print magazine. That’s certainly been the case for Newsweek and other weekly magazines. Circulation of the printed version of The Wall Street Journal, Business Week, Fortune and The Economist are down. See chart below. But not Forbes. Long live Forbes! Many people buy an entire box of 32 copies for only $300 postpaid. To order your copies at this super discount, call Harold at Ensign Publishing, toll-free 1-866-254-2057, or go to https://www.miracleofamerica.com/products/maxims-of-wall-street. Schumpeter Lecture, Stockholm, Sweden, Oct. 3: I’m headed to Stockholm to deliver the prestigious Schumpeter Lecture, named after the famed Austrian economist Joseph Schumpeter. Read about it here. My topic will be gross output (GO) as a paradigm shift. Sponsor Johan Eklund has arranged for me to meet with members of the Ministry of Finance to discuss their adopting Gross Output (GO). Dallas MoneyShow, Oct. 5-6: I’m delighted to be back in Dallas to moderate a main stage panel, “Washington Policy: How It Affects Your Portfolio,” with Steve Forbes, Steve Moore, Peter Schiff and Edward Yardeni. Earlier that morning, I will give the annual “alumni breakfast” talk. I’ll also be doing an encore of the “great debate” with Mike Turner on “The Economics Professor vs. the Mathematician: Buy-and-Hold vs. Market Timing.” I’m also on a luncheon panel to pick the next big winners with Bart DiLiddo, John Dobosz, Cody Willard and Kelley Wright. To sign up for your complimentary tickets, go to Skousen.DallasMoneyShow.com. New Orleans Investment Conference, New Orleans Hilton, Oct. 25-28: I’ve spoken at this “granddaddy of hard-money conferences” since 1977! This year’s keynote speakers include Fox News host Tucker Carlson, Fox contributor Charles Krauthammer, real estate mogul Robert Kiyosaki and commodity guru Dennis Gartman. For full information, go to http://neworleansconference.com/wp-content/uploads/2017/07/NOIC2017_skousen.html or call toll-free 1-800-648-8411. Be sure to mention you are a subscriber to Investor CAFE for a discount on the registration fee.